In 1969, just a few months before humankind’s first steps on the moon, a watch-maker presented El Primero the world’s first integrated automatic chronograph movement. That same year, one of the world’s best-known rock bands reached the height of its fame. 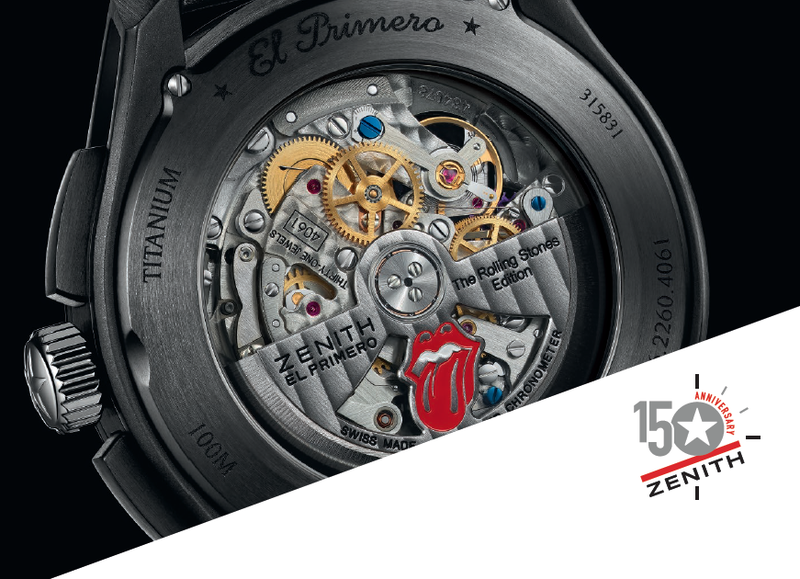 To celebrate this pivotal date, Zenith is launching a new version of the El Primero Chronomaster 1969 Tribute to The Rolling Stones. ZENITH, ALWAYS ONE IDEA AHEAD. In 1865, the small Swiss village of Le Locle in the Neuchâtel mountains was home to 3,000 farmers. When winter came, they made a living by exercising various watchmaking trades, each in their own separate way. Georges Favre-Jacot, a youthful entrepreneur barely 22 years of age, had the brilliant idea of bringing these talents under one roof in order to produce watches in their entirety and facilitate the relevant processes. Within just a few years, he thereby built one of the first industrial watch Manufactures in the modern sense of the term. Favre-Jacot was an innovative visionary who revolutionised the manner of taming time and instilled in his employees an enterprising spirit that has become a Zenith tradition. This was the very spirit that would inspire the Manufacture Zenith over the subsequent century and half to register 300 patents, create more than 600 movement variations and win 2,333 prizes in the field of chronometry: an absolute record. It was also this spirit that led in 1969 to the emergence of the world’s first integrated automatic chronograph movement, beating at the exceptional frequency of 36,000 vibrations per hour: the El Primero chronograph calibre, an acknowledged benchmark to this day. This movement has since given rise to an entire collection and powers a number of timepieces from the Manufacture. Zenith naturally wished to celebrate its friendship with rock’n’roll legends – The Rolling Stones – by crafting a modern watchmaking legend. It has done so by creating a new version of the El Primero Chronomaster 1969 Tribute to the Rolling Stones, this time issued in a 1,000-piece limited edition. The brand with the guiding star, which created the El Primero movement in 1969, and the stars of English rock music, who require no further introduction, have become partners. After all, would it not be fair to say that the watch company and the rockers share the same values of pleasure, daring and authenticity – since 1865 in the case of Zenith and since 1962 for The Rolling Stones? These five young musicians had exactly what it took to create a legendary group, starting with talent. Brian Jones, Mick Jagger, Keith Richards, Billy Wyman and Charlie Watts rapidly asserted the power of an inimitable style. The era also proved eminently propitious, since the early 1960s was the period when England was discovering pop music and rock’n’roll. The latter genre struck a strong contrast with the pop music of their rivals The Beatles. Finally, the originality of their compositions also played a key role, as epitomised in I can’t get no (satisfaction) , released in 1965, and Angie , in 1973. The legend was in the making and their success was planet-wide. More than 50 years later, it is still going strong. Indeed, The Rolling Stones will soon be going on a tour that will take them to 15 cities in North America, 14 of which will be in the United States. The tour will open in San Diego on May 24th and close in Quebec with a final concert on July 15th. As a truly worthy heir to the model that revolutionised the watch industry more than 40 years ago, the El Primero Chronomaster 1969 Tribute to The Rolling Stones reprises its codes while introducing a very dark, contemporary, rock-style look. This understated masculine watch is remarkable in every way. Firstly, by its DLC-coated titanium case fitted with pierced lugs, a design inspired by another icon from the same lineage: the El Primero Lightweight. It also features an automatic El Primero 4061 chronograph movement, chronometer-certified by the COSC (Swiss Official Chronometer Testing Institute): a novel feature that will apply to all Open models. This signature concept involving a dial opening at 11 o’clock revealing the regulating organ of the watch was born in 2003. It is specific to the El Primero line and gave rise to an entirely redesigned movement construction and a displacement of the balance and spring to the periphery of the calibre. The Rolling Stones model is also remarkable in terms of the avant-garde material used for the lever and escape-wheel: silicon. This material is harder and lighter than steel, as well as significantly more wear-resistant and less energy-hungry due to its low friction coefficient. It is also anti-magnetic and does away with lubrication-related problems. The hands echo the shape of the fretboard on the Fender Telecaster guitar played by Keith Richards, one of the pillars of the group. In addition, the snailed finish of the minute circle, as well as on the two 30-minute and 12-hour counters at 3 and 6 o’clock, are hollowed out like a dish, evoking the grooves on vinyl records and thereby contributing to the overall aesthetic coherence of this model. Nonetheless, this El Primero dedicated to the Rolling Stones is still very much a chronograph, since its inner bezel ring features a transfer bearing 300 divisions corresponding to fifths of a second. The central seconds hand is fitted with a star-shaped counterpoise. In the only touch of colour, its tip (like that of the counter hands and the small seconds trident at 9 o’clock) is red to ensure enhanced readability. The El Primero Chronomaster 1969 Tribute to The Rolling Stones also bears the other signature of this line: a slender bezel ensuring a generous dial opening and a box-style, slightly domed crystal enabling the light to pour in from the side and thus further enhance legibility. Fitted with a black PVD-coated triple folding clasp, the strap is composed of a rubber ‘spine’ featuring a Barenia leather insert. It is personalised in the ‘colours’ of the group and its native country, with the tongue logo and the British flag (Union Jack) tone-on-tone heat-embossed on the leather. The transparent sapphire crystal pane fitted on the case-back provides a view of the oscillating weight engraved with the famous red tongue and “The Rolling Stones Edition” inscription. The presentation box houses an inner box bearing the handwritten logo of the brand and that of Zenith, as well as a main case bearing the red tongue motif on the leather casing. The interior is also red to echo the dominant colour. The El Primero Chronomaster 1969 Tribute to The Rolling Stones is a 1,000-piece limited edition. January 10th 1969 saw the worldwide launch of Zenith’s integrated automatic chronograph movement. Born of a simple idea that required a full seven years to develop, the El Primero movement was a double world first: the first to provide a chronograph function other than in the form of a module; and also the world’s most accurate movement, with its high frequency of 36,000 vibrations per hour ensuring tenth-of-a-second precision. The aptly named movement soon became a modern-day haute horlogerie legend. Alongside these outstanding qualities, it displays exceptional resistance to extreme conditions, whether fixed to the landing gear of a Boeing 707 for a flight from Paris to New York, or on the arm of Felix Baumgartner doing a freefall jump from the stratosphere to break the sound barrier.